Ehow.com is one of the biggest content sites nowadays. The site has a couple of millions of high-quality articles on whatever topic you could imagine. There you can also watch thousands of interesting videos, tutorials, researches and many more great materials. Its main business idea is to be a place, where users are able to find the answer of any question beginning with “How to” – from how to mow your lawn, to how to launch a shuttle in the open space. Every month more than 40 million people from around the world visit the site and their number has been constantly growing. 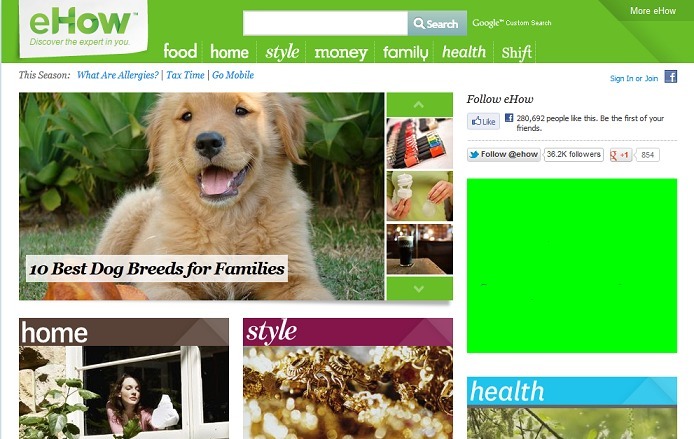 According to its revenue and profit, the site was valued at 1.8 billion of dollars in 2011. Ehow.com has become a huge and powerful online media and it’s growing further. What do they do? Nothing special, their main activity is simply publishing high-quality articles. In 1999, a guy named Courtney Rosen decided to start an online business. At that time, online companies were really hot, this was the time of the so-called “Dot Com Boom”. Courtney easily managed to raise $25 million venture capital and finance his enterprise. He hired 200 professional writers and some computer geeks to take care of the technical stuff. In a very short time, in 2001, the site already had more than ten thousand articles and more than 300 000 visitors per day. But despite the fast growth of the portal, it was still unable to make net profits. Then came the burst of the tech bubble and because of the lack of earnings, the fundings of the site dried up. Having no money to support it, the project was sold to “Idea Exchange”, by its founder. The new owner had plans to make the site paid and charge users for the access to the how-to tutorials. This turned out to be not that a great idea. Ehow.com was still losing money and this didn’t change for the next couple of years. That’s why, in 2004, “Idea Exchange” decided to sell the site to two guys – Josh Hannah and Jack Herrick. The two new owners ran the site all by themselves, without employees and technical staff. They made some changes and improvements, simplified it and made it more user-friendly. They also started a subproject – WikiHow, where every visitor could register and publish his/her articles. Slowly, but steadily ehow.com was coming back to life. When the two online entrepreneurs bought it (2004), it had around 240 000 visitors per month. Buy the middle of 2006, this number had increased 15 times to nearly 4 000 000 per month. In 2006, Hannah and Herrick decided to sell ehow.com to Demand Media, cashing in a nice profit from the deal. The new owners wanted to expand the site fast, so they launched weHow.com, where the registered users were able to publish their content. Soon, ehow.com and weHow.com merged. The content started growing fast, in 2007, the number of articles was around 135 000. Only a year later, there were more than 330 000. In 2010, the articles hosted reached 2 000 000. This is how a $1.8 billion business was created. Because of the too many writers, the quality of the materials decreased and the quantity greatly increased. The site had become one of the so-called “content farms”. These type of sites were penalized by major search engines in 2010, which caused a 40% decrease in traffic. Currently (2013), some big improvements have been made and the quality of content has been significantly improved. The site has restored its previous ranking and is continuing straight forward.